Have you ever paid attention to your thoughts? Have you ever considered their source? Where do thoughts come from and where do they go? Are they rooted in memories of the past, both positive and negative; or are they rooted in fear, loathing and fantasies of the future? How big is the mind? Does it have a boundary? Can you visualize how big the mind is? When thinking of how vast the Universe is, it begs the question: How big is the mind to contemplate something so vast as the Cosmos? Simple questions with interesting answers? Within our vast minds there are typically three facilities of thought. The first is thoughts rooted in the past: Experiences and memories for the most part. Then you have thoughts embedded in the future: Fantasy and daydreaming for example. Both elements of these thought facilities involve elements of fear, anger, sadness, pride, jealousy and some conviction – all integral fixtures of the ego. Surprisingly, these modes of thought take up probably 80% of your minds contemplation. 80%! Think about that for a moment. We almost always are living in the past which is gone or the future which has yet to materialize. It’s odd to think about right? Take the time to label your thoughts: Are they rooted in the past or future? The answer will confirm what we already know to be true. The third mode of thought is focused in the present moment. Being mindful of the present means we are not saddled down with fear and fantasy from the past and future, instead we are completely centered in the experience of life itself. Each moment in the present is fresh, acute and vivid. It is at this point we can reach a more spacious vision of life which is rooted in what I like to call our “true reality”. What is true reality? Well, only you can define that notion for yourself, for only you can determine why you were put on this Earth and for what purpose. To define your own true reality, you need to let your mind drop away from what you already perceive as reality. I know this sounds contradictory, but it is the only way to get beyond the constraints of the ego. This is not something that is going to happen immediately. It will be a gauged process of development. As you will soon realize, many of us lack a genuine level of self esteem. If we have any confidence it tends to be egocentric and a crude level of esteem. We tend to resemble a boutique of bad habits and passive addictions. We gain our confidence though money, materialism, the praise and opinions of others and self-gratification. We stumble through the day stressed and somewhat confused and empty. This reality is the mildly chaotic existence many of us live – sometimes unknowingly. How would we know any different? That is how life has always been… These are the mind facilities of the past and future; the Ego. The whole purpose in life is to achieve a personal level of enlightenment. I use the word “personal” because though the definition of enlightenment may have a common meaning, the true essence of enlightenment will be different for each person. Much like our finger prints which are unique to us as individuals, our own personal search for enlightenment is also unique and needs to fit our very own needs and desires. Like a hand print in the wet sand near the shore, your hand needs to fit the mold – thus being the perfect aesthetic match. The first problem that arises is that enlightenment, though defined, is not found in the “material world” we live in which is mostly dictated by those incessant thoughts of past and future. Rarely are we living in the present moment. In order to reach true illumination, we need to strip off the chains that shackle us to this ordinary world. We need to walk up hill even though most of society is walking down hill. Enlightenment is a blessed state in which the individual transcends desire and suffering and attains Nirvana. Nirvana is an enlightened state of being void of suffering. As you will find, the concept of suffering is the mainstay of this problematic “material world” we live in. Maybe you have heard of Abraham Maslow’s “Hierarchy of Needs” which describes an imaginary pyramid that begins with physiological needs at its base and aesthetic principles of self-directed growth at its apex. After the satiation of water, food and warmth comes love and safety issues. These needs are born from a more primitive human existence dating back millions of years. It was not until more recently – the last 3,000 to 5,000 years that humans began searching for self-actualization. This is when contemporary religion was born. Self-actualization is really just another term for enlightenment. This higher level of reasoning and understanding is really the last evolutionary step in human perception. We are now just entering into this new age of reason which includes asking the most pressing questions in life: Why do we suffer? What is God and how does the Universe function? These questions take us away from the dogmatic, close minded view of what religion has presented the last couple millennia and urges us to take a more dynamic approach. Deep down there is this almost primal hunger to know and understand. Religion was created by man to feed this hunger yet for many it is not enough. Our appetite is voracious and for many of us there is this peculiar feeling that the concept of God as it relates to the Universe is much more complex and magnificent. Somehow the concept of enlightenment figures into this cosmic puzzle that also includes feelings of bliss and love. Negative emotions like fear, anger and jealousy now seem more remote and gratuitous. This rift in emotions is explained by the two worlds I briefly mentioned earlier: The “material world” governed by ego (past and future thoughts) and our “true reality” (living in the present moment). Humans relate to opposites in life: Man and woman, night and day, even heaven and hell. 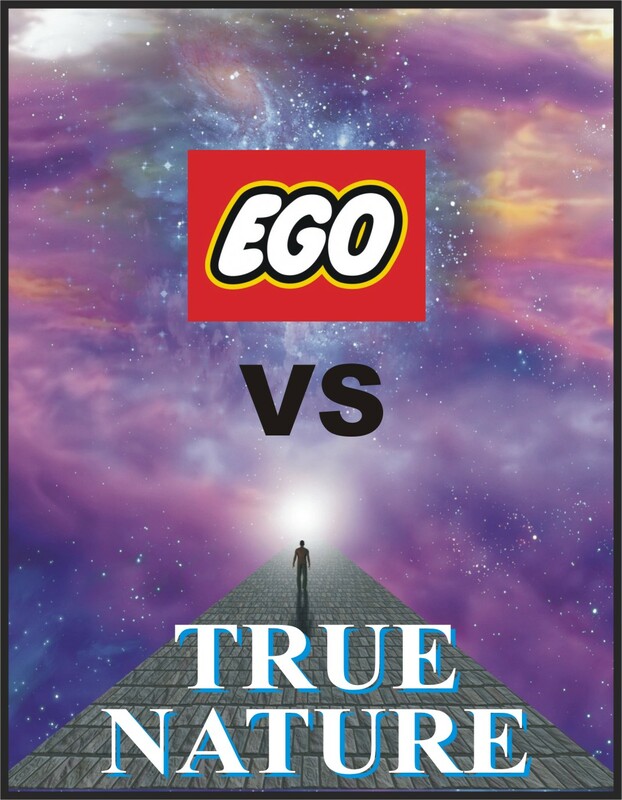 But what about Ego and True Nature? The ego is part of our mental devices that experiences and reacts to the outside world and thus mediates between the primitive drives of our being and the demands of the social and physical environment. The ego has many shortcomings in how it interprets reality. The first thing to understand is that the ego is merely an attachment that feeds off of human emotions. Much like a mosquito feeds off the blood of a mammal; the ego feeds off of our fears, fantasy and regulates our self-esteem. Self esteem is a person’s overall evaluation or appraisal of his or her own self-worth. The ego for better or worst thrives on ideals, beliefs and laws that determine a perception of the world and life that is larger than the individual. It becomes the governing force from which we unknowingly base our daily actions. Somewhere on the road of life the ego took up management status in our minds and controls every step we take in some facet. Born at a premature age, the ego incorporates the various ideals and beliefs that make up our surroundings as it relates to what others think and project. It is a complex array of sources that creates and fuels an ego: The unattainable benchmark set by celebrities to the materialistic urges brought forth by our peers and the advertising we are inundated with daily. It deals with social acceptance in communal arenas and the moral and mainstream pressures of life. In the “material world” the ego unknowingly gains power from these sources and we as malleable creatures inherit control patterns which subconsciously dictate our actions and reactions in life. Control patterns are subliminal hard-wired urges and intentions that are controlled by the ego and facilitate and reinforce the emotions of fear, anger, jealousy and low self-worth, many times unknowingly. Further, the ego grows stronger the more our contemplation facilities sit mired in thoughts of the past and future – again, mental imprints that take up more than 80% of your day. The opposite of our ego is our True Nature. The concept of True Nature is the intrinsic, immortal potential for reaching enlightenment in the mind of every sentient being. Its source and energy are born from the Cosmos. So what does that exactly mean? Quantum mechanics is the study of matter and energy, in particular the fact that energy is absorbed and released in minute quantities, and that all matter displays wave-like and particle like properties, especially when viewed at subatomic levels. Quantum mechanics suggests that the behavior of matter and energy is interconnected and that the effect of the observer on the physical system being observed must be considered part of that system. Broken down into rudimentary terms; we are made of quantum energy and we are interconnected to quantum energy; one complete living, breathing, pulsing orb of energy that is the Responsive Universe. When our mind facilities are rooted in the present moment, sans of past and future, we are connected to this Responsive Universe. Every unadulterated thought, action and reaction is interconnected down to the smallest subatomic matter. Your actions are that of a creator. You are the creator. You are God…. This is what True Nature is. It is your connection to the Universe where anything is possible. Further, this connection with humans and the Universe explains why karma, the power of prayer and an afterlife are scientifically possible (all topics I will discuss in future blogs). From a scientific standpoint, this energy is dependable and unwavering. Quantum energy can also be defined as a “life source” that connects to everything that exists in the Universe: From distant stars and galaxies to microscopic atoms within your body. As proven in quantum mechanics, everything has a quality of interconnected energy associated with it. All of this energy is indestructible as energy cannot be destroyed, it just changes form. From a humanistic standpoint, this energy is positive in nature as it exhibits no fear, anger or negativity – these fore mentioned negative traits are of man’s making (ego facilities). This positive quantum energy can include our thoughts, actions and the basis for our existence. It is the common denominator for everything that exists – the true definition of God. The ego defines the “material world” we were born into and True Nature defines the alternate Universe that exhibits our “true reality”; everything pure and unadulterated. THE PRESENT MOMENT! True Nature transcends all religion and even this world; again, its energy is constant and indestructible. Knowing this breeds clarity and a responsive quality in our minds. When our thoughts and perceptions are rooted in the present, the ego is powerless. This is why meditation is important because it is a process that trains the mind to reside in the present and not the past and future. The goal of self-discovery and enlightenment is to live more in the present moment and less in the past and future – thus connecting to this sublime dynamism that is your True Nature. Theoretical physicist says he found definitive proof that God exists. Theoretical physicist Michio Kaku claims to have developed a theory that might point to the existence of God. Michio Kaku is not a quack scientist but is instead a very respected physicist who has gone to great lengths to research, explain and prove the existence of String Theory. String theory is an active research framework in particle physics that attempts to reconcile quantum mechanics and general relativity (into the theory of everything). String theory teaches that the electrons and quarks within an atom are not 0-dimensional objects, but rather 1-dimensional oscillating lines or strings, hence the name. These invisible vibrating strings may be infinitely diverse with variables of inestimable value. This would suggest that other cosmic manipulations could exist beyond the edge of our known Universe. Many theoretical physicists including Stephen Hawking believe String Theory is a step towards the correct fundamental description of nature and the Universe. Physicist, Michio Kaku, has taken his work in String Theory even deeper. To come to his more recent conclusions, the physicist made use of what he calls “primitive semi – radius tachyons “. Tachyons are theoretical particles capable to “unstick ” the Universe matter or vacuum space between matter particles, leaving everything free from the influences of the surrounding universe. Pretty deep stuff… After conducting the revolutionary tests, Kaku came to the conclusion that we live in a “Matrix”. A cosmic fabric of space and time that by pure definition is everything that exists. You, me, the sub atomic world; The Universe in its totality. Kaku further interjected that God is a mathematician. That the source or energy of God lies in a “Cosmic Music”. The music of Strings as noted in his theories of String Theory. God is the 1-dimensional oscillating strings already theorized. This is a great quote from Pema Chodron; one of our great modern teachers of this era. I have written and defined a Mandala as a sphere of energy. In its simplest form, Mandala means circle. It is an ancient Buddhist symbol of inner and outer space where everything is linked as one from which the Universe and all its energy arise. We stand in the center of our circle and as we communicate with friends, family, community and society our proverbial sphere of influence tends to overlap much like the Olympic Rings overlap. Basic subatomic physics now explains in painstaking detail that our thoughts and actions react and change the fabric of the Universe. When we look at matter at its smallest form in the laboratory you now have to include the observer (scientist) as part of the experiment or observation because just the act of observing matter at the subatomic level changes the outcome. This can be applied to the mechanics of God but on a more social level it explains with science how every action and reaction we create does in fact cause a ripple… a dynamism of energy (positive or negative) that effects others and our own destiny. This explains karma, the power of prayer and positive manifestation. When we stand in the middle of our mandala; our personal circle of energy we will overlap into other peoples energy, thoughts, actions and reactions. Every small thought and action does matter. Like compound interest, positive and negative actions and reactions will add up over time to drive a mood, conversation or something more permanent within our lives and the lives of those we influence. What is the Ego? The Ego is your false-self; forged from societal immersion. It is true; we were not born with an ego. Through our struggles, triumphs and challenges the ego builds its layers of invisible hard-wired behaviors, many times unknowingly. The ego thrives on the ideals, beliefs, and laws of society and how we perceive ourselves within this society. These ideals color our perception of the world and of life. Our egos become the governing force from which we base our daily actions. The latter force of empowerment creates a false-self that, if unchecked, will foster negative self-esteem. Further, the ego can build this false confidence; though strong and seemingly indestructible, when the fleeting things that build your ego leave, fail or disappear (like money, friends and self-esteem) the walls the ego once built can come crashing down. True Nature is the opposite of ego. True Nature is everything left behind when you are egoless. Imagine stripping away negativity, evil, fear, guilt narcissism and jealousy (all ego facilities)– what are you left with? Only love, wisdom and positive energy – the heartbeat of existence. The source and energy of our True Nature is born from the Cosmos. Within the Cosmos, quantum mechanics suggests that the behavior of matter and energy is interconnected and that the effect of the observer on the physical system being observed must be considered part of that system. Further, this connection with humans and the Universe explains why Karma and an afterlife are possible. From a scientific standpoint, this energy is dependable and unwavering. 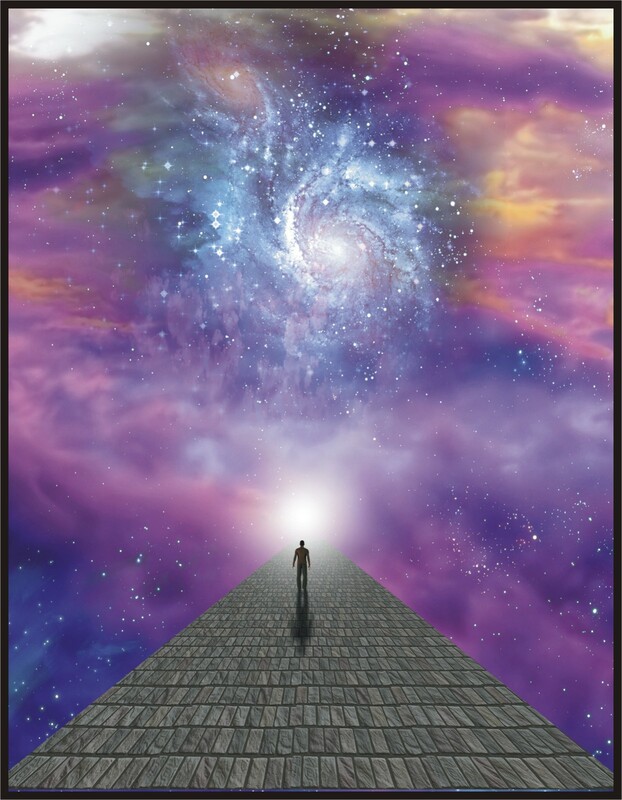 Quantum energy can also be defined as a life source that connects to everything that exists in the Universe: From distant stars and galaxies to microscopic atoms within your body. As proven in quantum mechanics, everything has a quality of interconnected energy associated with it. All of this energy is indestructible as energy cannot be destroyed, it just changes form. From a humanistic standpoint, this energy is positive in nature as it exhibits no fear, anger or negativity – these fore mentioned negative traits are of man’s making (ego). This positive quantum energy can include our thoughts, actions and the basis for our existence. It is the common denominator for everything that exists – the true definition of God. Indestructible! The ego defines the “material world” we were born into and True Nature defines the alternate Universe that exhibits our “True Reality”; everything pure and unadulterated. True Nature transcends all religion and even this world; again, its energy is constant and indestructible. Knowing this breeds clarity and a responsive quality to our minds. So which polar opposite are you more aligned with? There is this sublime world that exists beyond our atmosphere here on Earth. Occasionally we look out upon its back yard realm at night; gazing up at the neighborhood stars that dot our heavens above. Yet for the most part, people are entrenched with what is going on here on Earth. Rarely do people look up and marvel at the boundless nature of the Cosmos. The social static of ego, religion and conflict surrounds us and our mindfulness is preoccupied. Yet, people do find happiness and success in this earthly world but still we rarely pay attention to the Universe that surrounds us. There is a grand Universe home to over 200 billion galaxies and then there is this subatomic Universe within – also boundless. The Universe is where our energy was born and when we die it is where energy will return. This concept seems important, yet life goes on here on Earth and we all seem to trudge on facing our daily challenges, never fully aware of our deeper connections. Humans are generally self-centered – you see it with our politics, globally policies, economy and religion. The focus these days tends to be centered on quantity and not quality. Many people suffer in this world governed by big money and the elite. Is there another way? There is another world that exists stifled under the controlled chaos we habitually call life. It is the subatomic world that surrounds us. There is no evil in this world – only energy. The subatomic world is invisible and yet could be the key to everything that exists. Average humans are not interested in things they cannot see. We need tangible evidence and many of us are even swayed by the blind faith of others. Still, there is another world that exists – in fact, we coexist in both worlds. Without the subatomic world, humans would not be – the Universe would not exist. Again, seems important, right? The Quantum Universe is a peculiar place. When we observe subatomic energy at its smallest levels, the act of observing seems to change the properties of quantum matter. When we observe sub atomic energy at microscopic levels we see particles of matter. Yet when we are not observing this matter, scientific measures show that matter exists in a wave-like form – not particles. How does human consciousness connect, interrelate and alter sub atomic particles? Such manipulations seem to bring scientific plausibility to concepts like prayer, karma and positive and negative manifestations. Such musings even supports the concept of an afterlife. If the act of observing matter in its smallest form alters matter itself – do humans wield more power than we know? Is this the next evolutionary step? How can a particle be in two places at once? What about the plausibility of mult-universes as detailed by string theory. There is much we do not know and there is much to be discovered. Still, when you stop and appreciate the complexity of the Quantum Universe and the vastness of the Cosmos; and thus acknowledge that humans are a part of this system of order harnessing the ability to alter the fabric of the Subatomic Universe – well, it makes one wonder if anything is possible. Maybe, everything is possible? That my friend is the definition of a Responsive Universe. Find space in this Universe and clarity will arise from within. From this clarity comes a responsiveness that transcend all dogma and earthly trappings. This is your True Nature. Connect to these sublime qualities and a new world will reveal itself – a grand and beautiful Responsive Universe. Basically there are two governing forces or laws that describe matter: Einstein’s general theory of relativity and then quantum mechanics. The theory of general relativity explains gravity as it relates to galaxies, stars and planets and quantum mechanics explains the physics of our microscopic world (atoms, molecules and energy). The two worlds are understood and beautifully explained and yet live in separate but complimentary worlds; That is until we talk about singularity as it relates to the beginning of the Big Bang and the realm beyond the event horizon in black holes. It is then that our theories unravel and we realize we really only understand a small fraction of the workings of the Universe. For better or worse, I have always equated such unknowns as god’s country. Do you want to understand god? Then you must first understand the Cosmos. Fair assumption right? Here is a question: If we understood the working mechanics of the Universe would there be a need for God? Ancient religion and the loose concept of god were born from mans need to understand. As we continue to wrestle with age-old concepts of origin, death, afterlife and good verse evil – such musing reinforce the concept of god. Yet, if we understood where we came from and why things happen would the concept of god be necessary? These types of questions are what drive fear in the blind faithful. Without god, world order would collapse? Or would it? It is kind of a loaded question isn’t it? First, I have written many times that god is not something up in the sky and god is definitely not in the form of man (in fact, I do not even capitalized god) – I can’t think of anything more egotistical than comparing god to man or man to god. But, humans are pretty egotistical creatures – hence why the ego is so powerful. Maybe that is why there is also fear, war and this petty need to prove miracles and dogmatic explanations of our world. Still, I am here to say there is a god or at least a working concept of god. And it is not what most people think god should be. There is probably going to be a lot of disappointed parishioners out there. But there lies the problem with our current understanding of god. The concept of god is worshipped and put on a holy pedestal. People follow and do not lead. Fear and blind faith are taught and people are divided by their short minded views. Is contemporary religion really working? Look at all the famine, war and religious strife in the world. It is all pretty sucky if you ask me. Still, when we think of god as an instinctual energy that surrounds us and is us then the concept of god becomes palatable. God is everything – it is energy, gravity and quantum mechanics. God is prayer, meditation and karma. God is light and god is also darkness – it is everything. Once people realize this, there is this empowerment to lead and not follow. There is this genuine feeling that we are all connected and each of us has the power to make things better – in essence, the power of God. Maybe someday, a scientist will unravel the mysteries of singularity. Born from our need to know will come equations that will explain where we came from and where we will go when we die. That pretty much sums up god as it relates to contemporary religion. The historical and religious trappings that surround our gods are really just gratuitous. God is about birth, life and death. Funny, so is the Universe. And when we crack the riddles that hold us hostage, there will still be a place for love, compassion, karma and energy – the true essence of God. Look inward and you will find god.